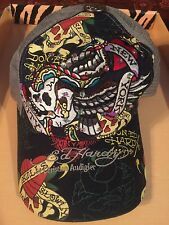 ED HARDY ($89.) NEW Shoulder Bag-Clutch-Purse/Wallet Florals on Canvas. NWT. 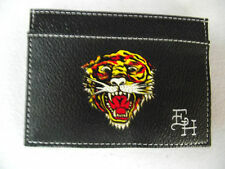 ED HARDY ($89.) 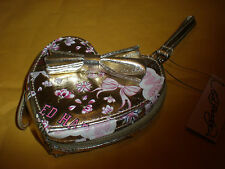 NEW Shoulder bag-Clutch-Purse-Wallet-Florals on Canvas NWT. 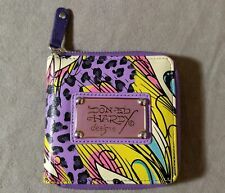 Multi-Color Ed Hardy Style Fish and Roses Wallet Unisex Men's 4.5" x 3" W-New! NICE! 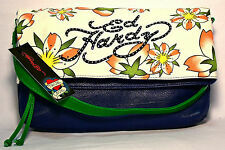 Women's Ed Hardy denim 'Fun' Heart Zipper Pouch Wristlet Case Bag Clutch.